Louie and I have been planning to go to Jomalig Island for quite a long time now. Fortunately we were able to get some time off because of some holiday. The original plan was to conquer Jomalig Island in Quezon. Unfortunately, we missed the last passenger (more like a cargo/fishing boat actually) boat going to the island. We were thinking of going to Alibijaban Island instead but it’s going to be another 4-6 hours worth of land and water. My spirit was at an all time low at this point. As I look up for help, I saw this billboard of Borawan Island and according to it, the island is less than an hour away. We didn’t wanna waste spend anymore time and money lurking so we decided to go there. A panoramic view of Borawan Island. I’ve read some blogs about this island, good and bad, so I didn’t really know what to expect but as I saw the awesome rock formation, I couldn’t help but be excited. When I saw the flags on top of the rock formations, I immediately told myself that I am not leaving this place without being eye level with those flags. If you are feeling brave, you can climb the awesome rock formations on the island. You can cliff dive on that spot if you are feeling adventurous. It was a Thursday morning so the island was virtually empty. While on the boat, Louie and I were already trying to decide where to camp. We found this lovely spot on the eastern side of the beach. And yes, our tent is in between 2 rock formations, how cool is that! This spot is actually quite isolated especially during the high tide when it get’s cut off from the rest of the island. I remember the tide being only 4-5 meters away from our tent. Not that it’s a bad thing as I enjoyed listening to the soft sound of the waves. This is the view from our tent. We thought it’s going to be quite a cozy place since the rock formations will serve as a natural wind breaker . Apparently that is not the case as it funneled the wind instead. Good thing the wind settled down during the evening otherwise we are in for a chilly night. The water on our side of the beach is quite deep and murky so if you want to do some snorkeling you have to walk to the other side where the water is clear and shallower. During the low tide, some parts of sea bed will be exposed. This is a great time to explore and look for food such as sea snails and sea urchins. We were looking for some fisher men who sell sea food but there were no fishing boats around. Good thing the security guard (yes, there is a shotgun wielding guard in the island) knew some of the locals there. 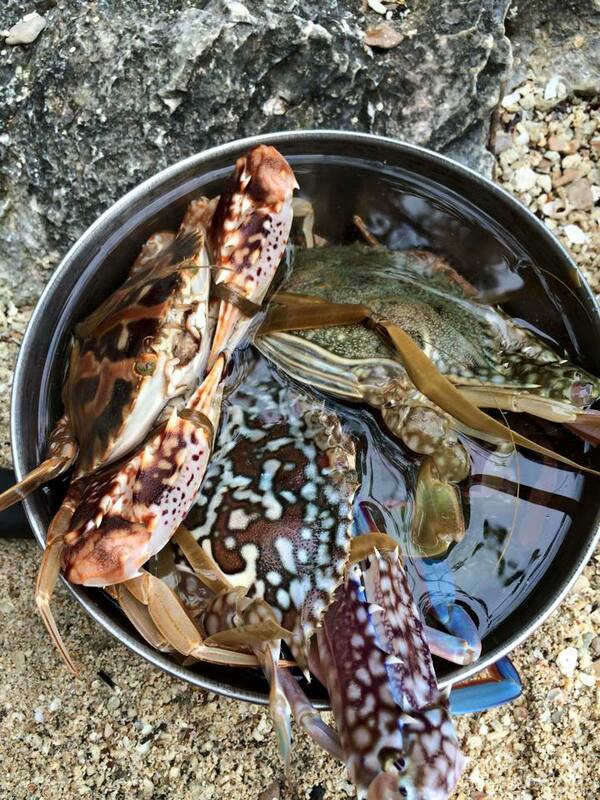 We bought a kilo of live crabs for lunch and boiled it in water and some salt. This is as fresh as it can get. You can really taste the sweetness of the crab meat. The crabs were full of aligue (delicious, fatty cholesterol goodness) it made me feel a little dizzy afterwards. This picture was taken before this cat (which I named Milka like all the other cats I encounter) decided to chill at our spot. Soon enough, we realized that felines and tents, like water and oil, definitely do not mix. In the evening, we decided to have a chat with the locals and I am glad we did. They told us stories about the island and how it was like before. They said monkeys can be seen in the island but were driven off by poachers. They did mention however that sometimes you can see the monkeys parading in the nearby hills. After our little chit-chat with Nanay and Tatay (they are the couple who lives and act as the caretakers in the island) we decided that it is time to call it a night. I found our tent quite comfortable considering the ground was covered in dead corals and pebbles. The next day, we went on a little trek to the other side of the island which was apparently owned by a wealthy couple. It’s not as beautiful as our side of the beach but it was good way to kill some time before our boat arrives to pick us up. Even though we weren’t able to push through with our original plan, I am still glad that we were able to see what Borawan Island has to offer. There are several clean toilets in the area and there is plenty of water. You can buy potable water at the little store owned by Nanay. Phone signal and 3G is quite strong. Photos and videos can easily be uploaded. The beach is somewhat clean as there are many caretakers on the island. No electricity though they have a generator that runs from 6 p.m. – 10 p.m. It can be quite crowded during the weekends and peak season.